So you want your child to make the best start in life? How about learning to ride a bike? This can often be one of the most stressful times for children and parents I remember teaching my daughter to ride, there were tears and tantrums. She so desperately wanted to do it, but just kept falling over. The fact was I left it too late, to make it easy. This is where the Strider PRE bike comes in, it teaches the basik skills of balance, control, gliding at an early age (from just 2) and before your child is in shoes they are zipping about on these things. So what is the Strider? The Strider bike is a small lightweight bike, with just two wheels (no stabilisers) which is foot powered. Designed for ages 1-5 it promotes learning of balance and coordination, without the difficulties of peddling. By the time your child graduates to a full pedal bike, most of the core skills will have been mastered and the transition should be smooth. Your child will have a boost in confidence through increased motor skills and practice. This is a compact, light weight bike. Its very simple to use as its like a normal bike, just without pedals, chains and gears (nothing much for little fingers to get trapped in). When the bike is moving there are little foot rests where the pedals were. The tyres are made from a puncture proof rubber, and the seat and handlebars can be adjusted. Riding is simplicity its self, the child just straddles the bike and starts walking. As confidence grows the saddle can be used, before graduating to a “push and glide” technique. There is the trademark Progression Headset system that helps a child’s stability by starting with stiffer bushings that loosen with use as he gains more control. As there are few parts, assembly is simple, done in less than five minutes. The frame is well made, and solid. And its easy to steer with the fully rotating handlebars. The seat can adjust from 11″ to 16″ to cope with the growth of your young rider. (There is even a longer XL Seat post available, and brakes if this should be out grown). Last, but not least, Striders come in an array of great exciting colours and designs sure to please any kid. The puncture proof tyres are a little smooth, that said with plenty of pavement and sidewalk use under them they have not proven an issue. No issues affecting the safety have been reported. With a headline price of $110, the Strider bike is a premium choice. What you get is a great looking bike that is well made and will last the growth period of your child. It will easily last being handed down to little brothers and sisters! 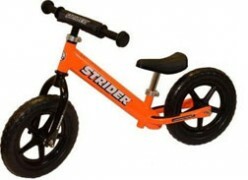 Get your Strider Bike today!